Giving a transformational presidential speech while trapped in politically toxic quicksand is no easy task. And as he mounts the rostrum in the House of Representatives' chamber on Wednesday night, the forces arrayed against Barack Obama  both real and those conjured by the politico-media maelstrom  are fierce. Liberals (in the blogosphere, at the grass roots and in Congress) complain that the President is a spineless, incompetent quitter. Conservatives (on Fox News and talk radio, at tea-party confabs and in Congress) insist that he is a panicky, on-the-run liberal. Old media sputter that he is a flailing, directionless Jimmy Carter redux. In just over a year, Obama has gone from a hopemonger destined to change America and revitalize the Democratic Party to a foundering President  from a man determined to bring America's best values to a capital gone bad to a man who has reinforced everything the country hates about government and politics. 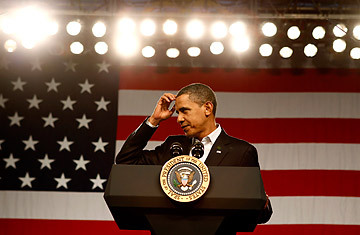 Although Obama has a history of using big speeches to spark or recalibrate his fortunes (the Democratic National Convention keynote in Boston in 2004, his Iowa Jefferson-Jackson Dinner speech in 2007, his oration on race in 2008, which was prompted by the controversy surrounding Chicago pastor Jeremiah Wright), no realistic appraiser of Obama's looming State of the Union believes he can turn everything around with one prime-time address. Obama's task is particularly tough because even before he will have finished speaking to tens of millions of Americans, the media filter (both old and new) will jump in to sift, analyze and reshape his message. For a weakened President, this is both a nuisance and a danger. 1. How big is the audience? If fewer Americans than usual tune in to the address on TV, it will suggest that the country has tuned out the President. The West Wing has to hope that the nation is still interested in what its (relatively) new leader has to say. 2. Does the press focus exclusively on process? The media are consumed with a proverbial turning-of-the-page, the tension between the White House and Democrats on Capitol Hill and the perils-of-Barack drama. Obama has to get the postspeech coverage to evaluate the substance of his proposals and his thematic vision of the country, rather than just focus on his droopy poll numbers and the loss of that Massachusetts Senate seat. 3. Do Republicans clap? Liberals and some White House aides have given up on ever getting meaningful cooperation from the opposition party on a legislative agenda. Obama doesn't have that luxury. GOPers will not like much of what the President says  and they smell both blood in the water and victory in November's midterm elections. But Obama has to find some areas of common ground to renew his campaign pledge to reduce the partisan bitterness and lack of cooperation that has come to dominate Washington and the nation's politics. 4. Can he find the right tone? How Obama needs to come off: optimistic, confident, resolute, gracious. What he has to avoid seeming: defensive, negative, churlish, sarcastic. Behind the scenes, Obama has been evincing some frustration with the media coverage of his first year in office; like most Presidents, he doesn't think he is getting enough credit for his hard work, nor enough patience for evolving efforts. But 2010 needs to be about the future, not grievances of the past  and that includes an end to blaming the Bush Administration for the problems Obama inherited. 5. Can he balance continuity vs. change? Presidential aides have been talking about going back to "first principles," the basic themes and programs that helped Obama get elected and animated his decision to run for President in the first place. At the same time, both substantively and symbolically, the press and many voters are going to expect Obama to demonstrate an awareness that his presidency is somewhat off course. Finding a way to stay faithful to both memes is as essential as it is tricky.